Based on the Renault-Nissan's Common Module Family. Renault has unveiled an all new 4-door D-Segment sedan that is all set to replace the Renault Laguna and Latitude sedans. With a modern design, innovative equipment on board, and a range of fuel efficient engines, the flagship Renault Talisman will take on the established German brands. Straight off the bat, Renault's Alliance partner, Nissan, have stated that the Nissan Maxima and Renault Talisman have no linkage and were not developed in tandem, despite the small difference in dimensions. 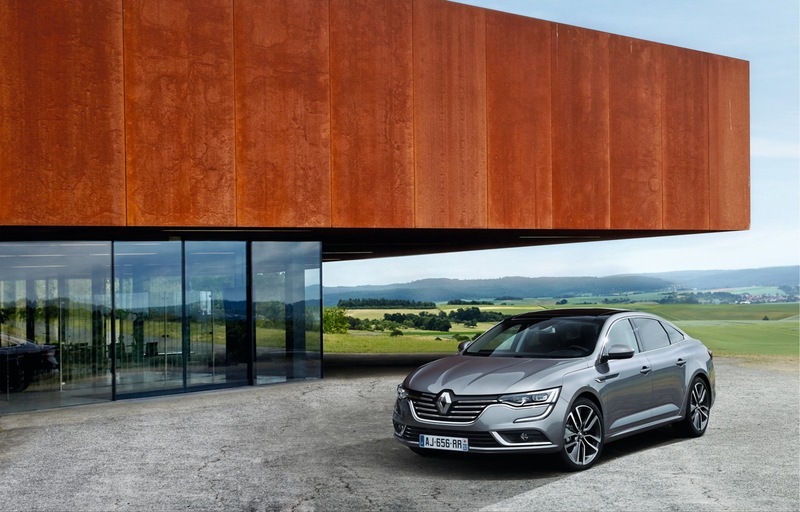 The Renault Talisman measures at 4.85 m long, 1.87 m wide, 1.46 m high with a wheelbase of 2.81 m. It is based on the Renault-Nissan Alliance's Common Module Family platform, which also underpins the Renault Espace MPV. Exterior wise, the Renault Talisman draws influence from the Renaultsport R.S 01 and the Espace MPV, as seen in the C-Shaped LED DRLs and long LED rear lights. The new LED headlamps flow into a V-shaped grille with chrome highlights, while intake running across the lower fascia sports chrome elements and foglamps. As is the current trend, the roof smoothly slopes towards the rear for a longer greenhouse. The rear end gets a sporty bumper housing large exhaust tips. The Talisman will have its public premiere at the Frankfurt Motor Show. 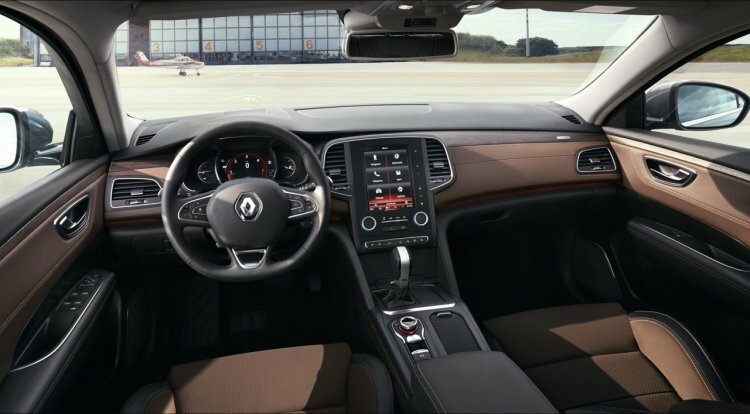 The interior of the Renault Talisman also borrows cues from the Espace, whilst being a major step up over its predecessors. The interior follows a dual-tone leather upholstery theme and comes adorned with wood and silver trim in the top variant, which lends a sense of luxury. Like the Renault Espace, it adopts a large 8.7-inch portrait-angled touchscreen system and central instrument display, so as to leave the interior uncluttered with buttons. It also features a heads-up display for feeding vital information without being obtrusive to the driver. Renault claims that the Talisman is best-in-class in terms of cabin space and all-round stowage capacity, with more than 25 litres of stowage space and a boot capacity of 608 liters. 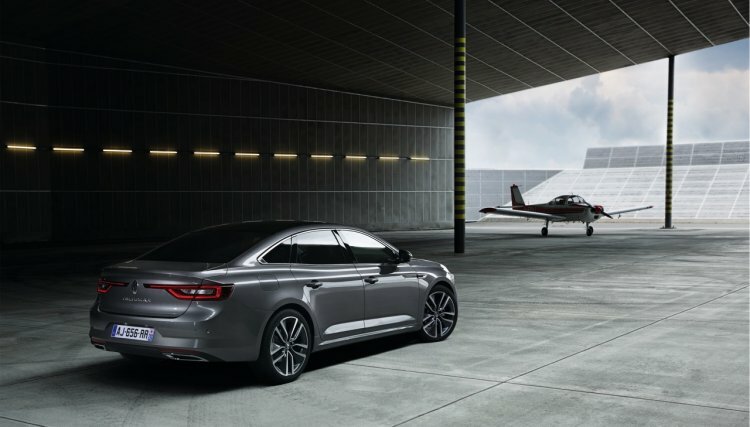 The Renault Talisman will be exclusively sold in LHD configuration. The Renault Talisman comes with a choice between two petrol and three diesel four cylinder engines; a 148bhp and 197bhp TCe turbo petrol, paired exclusively to a seven-speed dual clutch automatic, while there's a 109bhp, 128bhp and 158bhp dCI diesels with either a six-speed manual or six-speed dual-clutch autobox. The lowest-powered diesel variant boasts of emissions as low as 95g/km of CO2. Another interesting tidbit is that the Renault Talisman is the first sedan in its segment to offer 4-wheel steering, called as the 4Control system. It also comes with adaptive dampers for variable ride quality, depending on the driving mode selected. The Talisman also gets a four-wheel steer system. Renault has confirmed that the Talisman will not be engineered for right-hand-drive markets, thus ruling out the possibility of a launch in markets like the U.K, India and South Africa. It will make its debut at the 2015 Frankfurt Motor Show in September, followed by market launches across Europe in early 2016, before heading to Turkey, North America later on.